RNA interference (RNAi) is an ancient antiviral response that processes dsRNA and associates it into a nuclease complex that identifies RNA with sequence homology and specifically cleaves it. We demonstrate that RNAi mediated by 21-bp dsRNA specifically inhibits HIV-1 infection of permanent cell lines and primary CD4+ T cells. Inhibition of HIV replication was measured by p24 Gag protein content in supernatant, Northern blot analysis, and DNA PCR for products of reverse transcription. The inhibition occurred at two points in the viral life cycle, after fusion and before reverse transcription and during transcription of viral RNA from integrated provirus. Treatment of HIV-infected activated CD4+ T cells with a fluorine-derivatized siRNA that is resistant to RNase A yielded similar inhibition of HIV infection. In addition, the derivatized siRNA could be delivered without lipofectin complexing and in the presence of serum. The identification of RNAi activity against HIV-1 presents a new approach to study viral infections and a proof of concept of RNAi antiviral activity in mammalian cells. Ribonucleic acid interference (RNAi)3 is an ancient and conserved activity that controls viral infection and the expression of transposable elements and repetitive sequences (1). Originally described as an antiviral mechanism in plants, known as posttranscriptional gene silencing (PTGS), RNAi activity has been demonstrated in many organisms including humans (2, 3, 4, 5). The most important characteristic of RNAi is that it is specific. dsRNA, when acting as part of RNAi, reduces expression of genes with sequence homology, but has no effect on the expression of genes with unrelated sequence (1, 5, 6). RNAi functions as follows: 1) by identifying dsRNA and cleaving it into 21- to 23-bp fragments called small interfering (si) RNA by an enzyme called Dicer with RNase III activity; 2) the siRNA fragments associate with a multicomponent nuclease forming a complex known as the RNA-induced silencing complex (RISC); 3) the RISC hybridizes to target mRNA with a complementary region; 4) the target mRNA is cleaved in the middle of the 21- to 23-bp complementary region (1, 5, 6). Present studies of RNAi in mammalian cells have demonstrated that exogenous genes delivered by DNA transfection as well as endogenous gene expression can be suppressed by the delivery of siRNA (4, 7). In this study, we demonstrate suppression of HIV-1 infection and replication in permanent cell lines and primary activated CD4+ T cells by siRNA specific for different regions of HIV-1. HIV is a ssRNA virus in the lentivirus family that reverse transcribes and integrates its genetic material into the host chromosome. The integrated provirus is organized as a eukaryotic transcriptional unit with the 5′-long terminal repeat (LTR) containing a strong enhancer/promoter region and the 3′-LTR encoding a polyadenylation site. A primary transcript of the HIV provirus serves as the genomic RNA for future generations of HIV and is processed to ensure efficient translation of viral proteins. During the viral life cycle, viral RNA is present in the cytoplasm of cells after fusion and before reverse transcription, which presents a target that when acted on can inhibit infection before proviral integration. A second recently described necessity for transcription of the viral DNA in the cytoplasm after reverse transcription and before nuclear import and integration offers an additional target (8). Cells harboring proviral HIV, such as reservoirs or acutely infected cells that have progressed past proviral integration, can also be targeted by RNAi-mediated inhibition of viral replication by targeting viral RNA transcripts produced from the provirus. The 293T and U87-CD4+-CCR5+ and CXCR4+ cells (AIDS Reference and Reagent Program) were propagated in DMEM supplemented with 10% FBS, 15 mM HEPES buffer, and 2 mM l-glutamine (Life Technologies, Gaithersburg, MD) (DMEM complete) at 37°C in a 5% CO2 incubator. PBMC were obtained under an Institutional Review Board-approved protocol. PBMCs were stimulated with PHA (Sigma-Aldrich, St. Louis, MO) at a concentration of 4 μg/ml for 3 days in RPMI 1640 medium supplemented with 10% FBS, 15 mM HEPES, and 2 mM l-glutamine (RPMI complete). Activated T cell blasts were washed three times in PBS and plated in RPMI complete medium supplemented with 20 U/ml IL-2 (AIDS Reference and Reagent Program). S2 cells were grown in DES expression medium (Life Technologies) at 25°C. siRNAs were constructed using two approaches. The first method used chemical synthesis of ssRNA (Dharmacon, Lafayette, CO). The RNA sequences corresponded to conserved regions of the HIV-1 core protein Gag and the coding sequence of firefly luciferase. The sequences were: luc1, 5′-CAUUCUAUCCUCUAGAGGAUGdTdT-3′, and gag1, 5′-GAGAACCAAGGGGAAGUGACAdTdT-3′ (HXB2 position 1475). The second approach used DNA oligomers containing a T7 dsRNA polymerase promoter, followed by 21 bp of ssDNA homologous to the sense or antisense regions to be targeted and terminated with 2 C to form a 3′-overhang as a template for transcription with T7 RNA polymerase (Megashortscript; Ambion, Austin, TX). Regions of sequence chosen for the production of siRNA by enzymatic transcription contained a C and a G separated by 19 nt. This allowed a G to be present as the first nucleotide downstream from the T7 promoter in both sense and antisense DNA oligomers, ensuring efficient transcription. siRNA made by T7 transcription with standard nucleotides were designated gag2, luc2, and 3′-LTR2. The third approach used fluorine-derivatized cytidine 5′-triphosphate (CTP) and UTP to generate ssRNA with T7 polymerase (DuraScribe T7 transcription kit; Epicentre, Madison, WI) using the same DNA oligomers described above. These siRNA were called gag3, luc3, 3′-LTR3. The sequences were: luc2 and 3, 5′-CAUUCUAUCCUCUAGAGGAUG-3′; gag2 and 3, 5′-GGGCAAGCAGGGAGCUAGAAC-3′ (HXB2 position 896); and 3′-LTR2 and 3, 5′-GAUGGUGCUUCAAGCUAGUAC-3′ (HXB2 position 9215). RNA oligomers in water were annealed at a concentration of 50 mM each with an initial hold at 90°C for 1 min, followed by a time-controlled cooling to room temperature over 60 min. Annealing was confirmed on 15% Tris-borate-EDTA polyacrylamide gels (Bio-Rad, Hercules, CA), followed by ethidium bromide staining and UV illumination. Cells were cotransfected with TEV (the leader sequence from the tobacco etch virus that promotes translation (9))-luciferase or TEV-gag encoding mRNA (0.1 μg in 50 μl) and siRNA (0.1 μg in 50 μl) complexed to lipofectin, as described previously (10). Luciferase-transfected cells were lysed with luciferase lysis buffer (Promega, Madison, WI) and analyzed with luciferase substrate (Promega) in a Dynatech MLX luminometer (Chantilly, VA). Supernatants were analyzed for p24 Gag protein content by ELISA (Beckman-Coulter, Miami, FL). U87-CD4+-CXCR4+ cells were infected with the HIV-1 IIIB virus. U87-CD4+-CCR5+ cells were infected with the HIV-1 Ba-L virus. T cell blasts were infected with both viruses. HIV-1 viral stocks were acquired from the Center for AIDS Research at the University of Pennsylvania. Aliquots of 0.3 ng (9.8 infectious units (iu) of IIIB and 15 iu of Ba-L), 3 ng (98 iu of IIIB and 152 iu of Ba-L), or 10 ng (293 iu of IIIB and 456 iu of Ba-L) of virus in a final volume of 100 μl were added to cells. After 2 h at 37°C, cells were washed extensively with PBS and cultured in complete medium, with added IL-2 (20 U/ml) for T cell blasts. Cells were transfected with siRNA (0.2 μg in 50 μl) complexed with lipofectin, or siRNA was added directly to serum-containing medium (4 μg/ml) either 24 h before or 3 days after infection. Infection was monitored by measuring supernatant-associated p24 Gag protein content. RNA isolation and Northern blot analysis were performed as described (11). The blots were probed with gag (NcoI/BamHI fragment from pDAB72 (12)), HIV (BamHI fragment (13)), and GAPDH (pHcGAP from American Type Culture Collection, Manassas, VA). Bands were quantitated by PhosphorImager (Storm; Molecular Dynamics, Amersham Biosciences, Sunnyvale, CA). Real time quantitative PCR analysis was performed 20–24 h after infection. Virus used in PCR experiments was treated with DNase I (20 U/ml with 5 mM Mg2+) (Roche Diagnostics, Indianapolis, IN) for 30 min to remove contaminating DNA. Cells were lysed in 25 μl of lysis buffer (100 mM KCl, 20 mM Tris, pH 8.4, 0.1% Nonidet P-40, 500 μg/ml proteinase K (Sigma-Aldrich)). Real time PCR was performed in a PerkinElmer 7700 Sequence Detector (Boston, MA) with gag, strong stop, and GAPDH-specific primers and probes, as described previously (14). Binding and internalization of HIV were determined, as described previously (15). Briefly, cells were incubated with 10 ng HIV-1 Ba-L in 50 μl for 2 h at 37°C, washed three times in PBS, lysed, and assayed for p24 Gag protein content by ELISA. The delivery of dsRNA longer than 30 bp to mammalian cells results in the activation of nonspecific mRNA degradation and inhibition of protein synthesis through the IFN-α system (4, 7). The 21- to 23-bp siRNA are capable of inducing specific mRNA degradation without activating this nonspecific pathway (4). PTGS in plants acts on cytoplasmic viral RNA (16). HIV-1 RNA is present in the cytoplasm after fusion and before reverse transcription, and transcription of the provirus before nuclear import and integration may be required for efficient infection (8). Thus, these intermediates present targets for RNAi-mediated suppression. As a model of these targets, we sought to determine whether siRNA-mediated RNAi could specifically suppress translation from RNA delivered to the cytoplasm through the plasma membrane. We prepared siRNA by two methods, one chemical synthesis as described (17), and the second through T7 RNA polymerase-mediated transcription from DNA oligomers (18). Two mRNAs, one encoding the HIV-1 core protein Gag and the second encoding firefly luciferase, were cotransfected into 293T cells along with luciferase- or gag-specific siRNA. 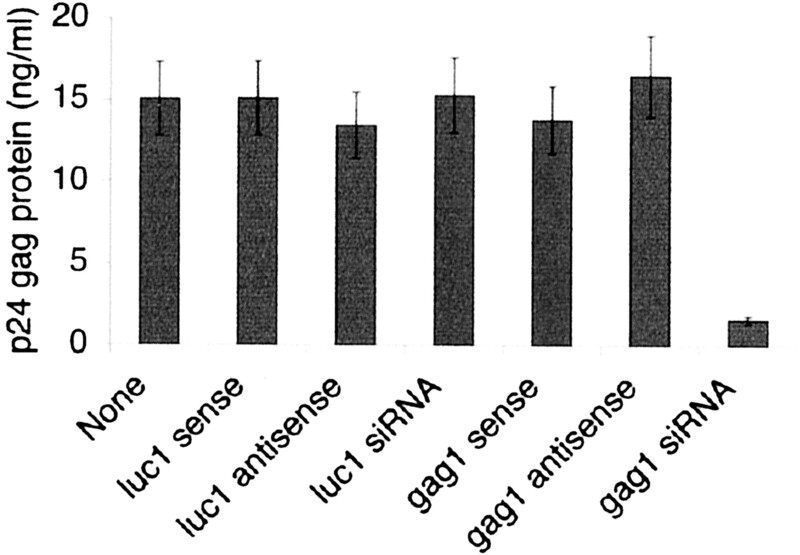 Gag expression was reduced by siRNA homologous to gag with no effect on luciferase production, while siRNA homologous to luciferase did not affect Gag protein production while inhibiting luciferase activity (Fig. 1⇓A). These studies demonstrated that mRNA entering a cell through the plasma membrane could be specifically targeted by siRNA-mediated RNAi. The specificity of siRNA-mediated inhibition is demonstrated by the lack of effect observed with nonhomologous siRNA. siRNA specifically suppresses protein production from luciferase or HIV-1 gag encoding mRNA. A, 293T cells were cotransfected with gag encoding mRNA, luciferase encoding mRNA, and gag- or luciferase-specific chemically synthesized siRNA. Twenty-four hours later, supernatant was analyzed for p24 Gag protein content by ELISA, and cell lysates were analyzed for luciferase activity. Error bars represent SEM for duplicate wells and duplicate measurements. B, 293T cells transfected with luciferasase encoding mRNA were treated with the indicated siRNA in the presence (dark gray) or absence (light gray) of lipofectin complexing, suffix code 1-chemically synthesized, 2-T7 DNA oligos transcribed with standard nucleotides, and 3-T7 DNA oligos transcribed with fluorine-derivatized nucleotides. Three hours later, cells were lysed and luciferase activity was quantitated. Data are expressed as the percentage of inhibition of lipofectin or medium-treated luciferase mRNA-transfected 293T cells. Error bars indicated the SEM. Data are representative of at least three experiments for each condition. The potential clinical use of siRNA-mediated inhibition of HIV-1 has many limitations. One is the ability to deliver siRNA in vivo. siRNA were made using a T7 transcription reaction with CTP and UTP replaced by 2′-F-dCTP and 2′-F-dUTP. This results in RNA that is resistant to RNase A (Epicentre, Madison, WI), but has the ability to be recognized by reverse transcriptases (Epicentre) and incorporated into RNA by RNA polymerases, and has the expected weight and structure by mass spectroscopy (19, 20). Luciferase- and gag-specific siRNA made by chemical synthesis (luc1, gag1), T7 polymerase transcription of DNA oligomers (luc2, gag2), and T7 polymerase transcription with fluorine-derivatized nucleotides (luc3, gag3) were either complexed with lipofectin or added without complexing (naked) to 293T cells transfected with luciferase encoding mRNA. Three hours later, cells were lysed and luciferase activity was measured. Data are from at least three experiments for each condition and are expressed as percentage of inhibition of control (lipofectin- or saline-treated, luciferase mRNA-transfected 293T cells) luciferase levels (Fig. 1⇑B). This demonstrated that similar inhibition was observed for each method of siRNA production, that fluorine-derivatized siRNA was effective and specific in inhibiting luciferase expression, and that fluorine-derivatized siRNA could be delivered without lipofectin complexing and in the presence of serum. To test whether RNAi was capable of inhibiting ongoing viral replication, U87-CD4+-CXCR4+ and U87-CD4+-CCR5+ cell lines capable of supporting T- and M-tropic HIV replication, respectively, were infected with HIV-1 IIIB, T-tropic lab strain, and Ba-L, M-tropic virus. 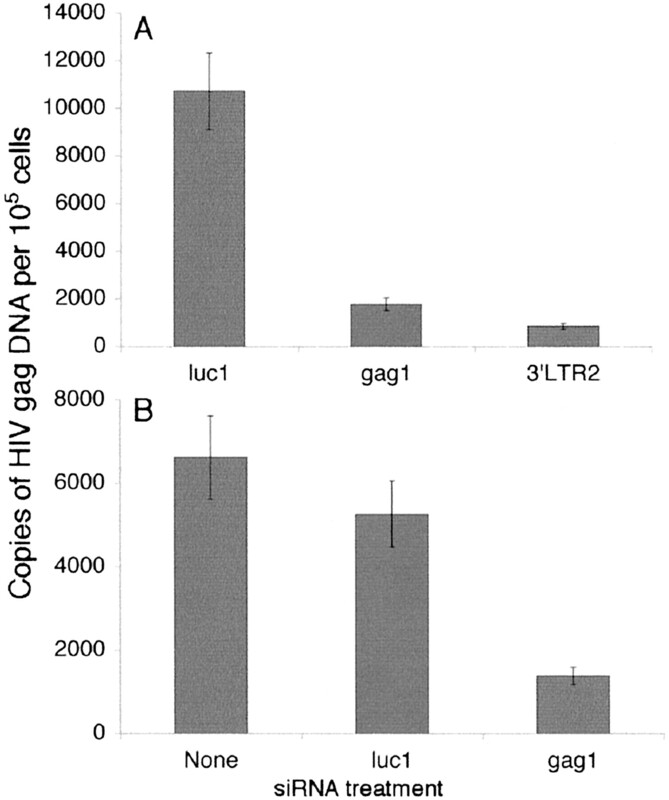 siRNA sequences targeting gag and the 3′-LTR were chosen to be completely homologous to both IIIB and Ba-L strains of HIV-1. The 3′-LTR sequence was chosen, as it is in the noncoding sequence before the poly(A) tail of all HIV-1 RNAs except nef encoding RNA, where it is within the coding sequence. Three days after infection, cells were transfected with enzymatically synthesized gag-specific or control siRNA or treated with lipofectin alone, and supernatants were collected to follow infection. p24 Gag protein analysis revealed that U87 cells transfected with siRNA homologous to gag showed a decrease in viral replication that lasted for 3 days, while control siRNA displayed no depression of viral replication compared with lipofectin-treated cultures (Fig. 2⇓, A and B). Loss of suppression of viral replication was observed by day 4 after siRNA treatment. The amount of specific suppression by gag-specific siRNA (0.2 μg/50 μl) ranged from 75 to 96% in U87 cells, which is similar to that observed for other mRNA targets by other investigators in mammalian cell lines (1, 4, 21). The delivery of lower concentrations of siRNA resulted in a loss of viral suppression (Fig. 2⇓C). HIV-1-specific siRNA suppresses ongoing HIV-1 replication in U87 cells expressing CD4 and CCR5 or CXCR4. A, U87-CD4+-CCR5+ cells were infected with HIV-1 Ba-L strain (10 ng, 456 iu, in 100 μl) for 2 h and washed. Three days later, cells were transfected withT7 RNA polymerase-transcribed gag-specific or control siRNA complexed with lipofectin (arrow). B, U87-CD4+-CXCR4+ cells were infected with HIV-1 IIIB strain (10 ng, 293 iu, in 100 μl) and treated, as described above. Supernatants were collected at the indicated time points and assayed for p24 Gag protein content. C, U87-CD4+-CCR5+ cells were infected with HIV-1 Ba-L and treated with the indicated concentration of siRNA 3 days after infection. Three days later, p24 Gag protein content was measured. Error bars represent SEM for duplicate wells and duplicate measurements. Data are representative of at least three experiments. To demonstrate that dsRNA was mediating the suppression of HIV-1 replication, U87-CCR5+-CD4+ cells infected with HIV-1 Ba-L were treated with the single-stranded sense or antisense chemically synthesized RNAs used to make the siRNAs. Suppression of HIV-1 replication was only observed when cells were treated with gag-specific dsRNA (Fig. 3⇓). Similar studies using T7 RNA polymerase-transcribed RNA also demonstrated specific inhibition only with gag-specific dsRNA (data not shown). Suppression of HIV-1 replication is only observed when dsRNA homologous to gag is used. U87-CD4+-CCR5+ cells were infected with 10 ng, 456 iu, of HIV-1 Ba-L in 100 μl. Three days later, cells were transfected with the indicated chemically synthesized siRNA, and two days later, p24 Gag protein content in the supernatant was measured. Error bars represent SEM for duplicate wells and duplicate measurements. Data are representative of five experiments. The inability to transfect primary cells with nucleic acid is a major obstacle in the field of gene therapy. Our previous results studying the delivery of mRNA by lipofectin transfection demonstrated efficient delivery to primary dendritic cells. Over 95% of transfected cells expressed the encoded protein (22). Given the success in delivering RNA to primary cells, the ability of siRNA to suppress viral replication in PHA plus IL-2-activated primary CD4+ T cells (T cell blasts) was then assessed. T cell blasts transfected with siRNA homologous to gag or the 3′-LTR of HIV-1 3 days after HIV-1 Ba-L infection demonstrated suppression of viral replication, while control siRNA showed no effect on viral replication compared with lipofectin-treated cells (Fig. 4⇓A). siRNA could be added between 2 and 5 days postinfection and result in inhibition of viral replication. Once high levels of viral replication were present in the culture, day 6–9, inefficient inhibition was observed (data not shown). Sense and antisense ssRNA used to make the HIV-specific siRNA did not inhibit HIV infection in primary T cell blasts (data not shown). The 3′-LTR siRNA targets sequences at the 3′-terminus of the nef coding sequence before the poly(A) tail. This sequence is present in all spliced and unspliced RNA produced from the provirus, while the sequences targeted by the gag-specific siRNA are only present in the unspliced viral RNA. siRNA specific for the 3′-LTR of HIV-1 gave similar suppression of viral replication compared with gag-specific siRNA. The combination of gag and 3′-LTR siRNAs at one-half the concentration of each gave greater inhibition of viral replication, suggesting a synergistic effect of targeting multiple sites. Unlike siRNA inhibition of HIV-1 replication in U87 cells, continued suppression of HIV-1 replication could sometimes be observed in T cell blasts. The amount of rebound in viral replication varied between 22 and 74% of the peak value of viral replication in the luciferase-specific siRNA-treated cultures. No obvious cause(s) for the varied rebound in viral replication was evident. HIV-1-specific siRNA inhibit HIV-1 replication in PHA-activated primary CD4+ T cells. A, PBMC from an HIV-1-uninfected subject was stimulated for 3 days with PHA, washed, cultured in IL-2, and infected for 2 h with HIV-1-Ba-L (10 ng, 456 iu, in 100 μl). Three days later, cells were transfected with T7 RNA polymerase-transcribed luciferase or HIV-1-specific siRNA complexed with lipofectin (arrow). B, T cell blasts infected as in A were treated with fluorine-derivatized T7 RNA polymerase-transcribed gag-specific ssRNA or siRNA or other siRNA in the absence of lipofectin complexing in the presence of serum. Supernatants were collected at the indicated time points (A) or 3 days post-siRNA treatment (B) and assayed for p24 Gag protein content. Error bars represent SEM for duplicate wells and duplicate measurements. C, Day 3 HIV-infected T cell blasts were treated with fluorine-derivatized control and HIV-specific siRNA. Four days later, total RNA was obtained and analyzed for gag- and GAPDH-specific RNA by Northern blot. Data are representative of at least six (A and B) or three (C) experiments. Gag and control ssRNA and siRNA were made with fluorine-derivatized RNA and used to inhibit HIV-1 replication in T cell blasts. RNA without complexing to lipofectin was directly added to 3-day HIV-1-infected T cell blasts in serum-containing medium. Three days later, culture supernatant was analyzed for p24 Gag protein content. The gag-specific fluorine-derivatized siRNA effectively inhibited HIV-1 replication (Fig. 4⇑B). These data demonstrate that HIV-specific siRNA made resistant to RNase A could be added to cells in the presence of serum without complexing to lipofectin and mediate sequence-specific silencing of HIV replication. RNAi acts to specifically cleave RNA with sequence homology to the 21-bp siRNA. Total cellular RNA was obtained from HIV-1-specific or control siRNA-treated HIV-1-infected T cell blasts 1–4 days after siRNA treatment and analyzed by Northern blot for gag- and GAPDH-specific RNA. A significant, average 73%, reduction in gag RNA was observed by gag and 3′-LTR-specific siRNA, when normalized for GAPDH RNA (Fig. 4⇑C). Inhibition was observed for both Ba-L and IIIB strains of HIV-1 and on days 1–4 post-siRNA treatment. Similar inhibition of HIV-1 RNA accumulation was obtained when a probe including Tat, Nef, and Env was used to probe RNA from control and HIV-1-specific siRNA-treated primary T cell blasts (data not shown). We observed that siRNA-mediated RNAi could inhibit protein production from mRNA that entered the cell through the plasma membrane, and we sought to determine whether viral infection could be inhibited after viral entry and before reverse transcription. U87-CD4+-CXCR4+ and U87-CD4+-CCR5+ cells were transfected with control and HIV-1-specific siRNA. Twenty-four hours later, cells were infected with HIV-1 strains IIIB and Ba-L, respectively. Twenty hours later, cells were lysed and analyzed by real time quantitative PCR for gag DNA (14). Cell numbers for each experimental condition were determined using GAPDH primers and probe, and copies of HIV-1 DNA per sample were corrected for cell number. 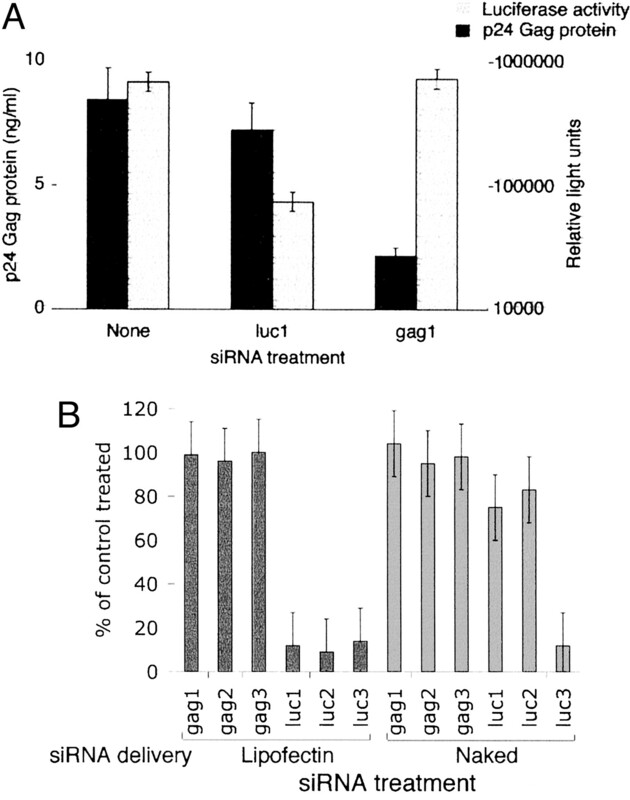 Cells transfected with siRNA targeting gag or the 3′-LTR had less gag DNA per cell (Fig. 5⇓A and data not shown), indicating inhibition before the completion of reverse transcription. Primary T cell blasts were treated with HIV-1- or luciferase-specific siRNA 2 (data not shown) or 24 h before infection with HIV-1 Ba-L virus. Twenty-four hours later, cells were lysed and analyzed for gag and GAPDH DNA. HIV-1-specific siRNA reduced the number of copies of HIV-1 gag DNA per cell, indicating inhibition of viral infection before reverse transcription in primary CD4+ T cells (Fig. 5⇓B). Analysis with primers for 5′-negative strand strong stop DNA gave similar results, suggesting that RNAi inhibited early and late stages of reverse transcription. To control for equal viral uptake by siRNA-treated cells, U87-CD4+-CCR5+ cells treated with HIV-specific and control siRNA were incubated with HIV-1 Ba-L for 2 h, washed, lysed, and analyzed for bound and taken up HIV by p24 Gag protein content analysis. Untreated, HIV-specific, and control siRNA-treated cells had similar levels of p24 Gag protein. HIV-1-specific siRNA suppresses infection before reverse transcription. A, U87-CD4+-CXCR4+ cells were transfected with luciferase- or HIV-1-specific chemically synthesized siRNA except for 3′-LTR, which was produced from T7 RNA polymerase-transcribed DNA oligomers, siRNA, followed by infection with DNase-treated HIV-1 IIIB virus (10 ng, 293 iu, in 100 μl). B, PHA blasts were transfected with luciferase- or HIV-1-specific chemically synthesized siRNA and then infected with DNase-treated HIV-1 Ba-L (10 ng, 456 iu, in 100 μl). Twenty (A) or twenty-four (B) hours later, cells were lysed and analyzed for HIV-1 gag and GAPDH DNA content by real time quantitative PCR. Copies of HIV-1 gag were normalized for copies of GAPDH and expressed as copies of HIV-1 gag DNA/105 cells. Data were obtained from at least four experiments for each condition. RNAi is an antiviral response found in many organisms. The enzymes that mediate specific cleavage of mRNA through RNAi have been observed in organisms from fungi to mammals (1). The role of RNAi-like activities in controlling viral infection and transposable elements has been established in plants and other invertebrate organisms. This includes analyses of RNAi/PTGS gene knockouts that demonstrate increased viral replication and the observation that certain plant viruses encode inhibitors of the PTGS silencing pathway (reviewed in Ref. 23). The role of RNAi in controlling viral infection in vertebrates is unknown. The predominant response to viruses with a dsRNA intermediate is mediated by the induction of IFN-α (reviewed in Ref. 24) and activation of enzymes that nonspecifically cleave mRNA and inhibit protein synthesis. Whether RNAi in mammals is functional in the control of viral replication is an important question. The enzymes used in RNAi are used by other systems, including nonsense-mediated RNA decay, which is an important system controlling mRNA fidelity (25) and processing of small temporal RNA that are highly conserved and important in gene regulation (26), suggesting that their presence does not equate with functional use in RNAi. We demonstrate that siRNA-mediated inhibition of HIV-1 infection occurred at two points in the viral life cycle. After binding of virions to CD4 and chemokine receptor expressing target cells and fusion, the HIV-1 core containing viral genomic RNA, reverse transcriptase, and proteins necessary for nuclear import and chromosomal integration is released into the cytoplasm. We demonstrate that HIV-1-specific siRNA inhibit infection before the completion of reverse transcription, most likely by cleaving genomic RNA in the cytoplasm. A second site of inhibition of HIV-1 replication is also identified. After integration, the provirus becomes a eukaryotic transcriptional element producing full-length viral RNA that is cleaved to produce RNA encoding all of the viral proteins necessary for replication. HIV-1-specific siRNA targets this viral RNA for destruction. Although the studies presented can definitively demonstrate inhibition at a preintegration stage by RNAi, they cannot exclude that the suppression of viral replication observed when cells are treated 3 days after infection occurs through a targeting of viral RNA made from the integrated provirus. A recently reported study using an infectious molecular clone demonstrates that viral RNA made from the provirus (infectious molecular clone) can be targeted by RNAi (27), and our preliminary data are in agreement using siRNA (K. Karikó, J. Capodici, and D. Weissman, unpublished observations). The ability of HIV-1 infection and replication to be inhibited by RNAi mediated by siRNA presents a new approach to both study and treat HIV-1 and potentially other infectious and neoplastic diseases. Although not specifically addressed in this study, the ability to knock down specific viral proteins during different stages of infection is potentially achievable. This would allow the dissection of the role of specific proteins during various stages of infection, including latency and reactivation without concern for the effect of that protein during earlier stages of infection. Similar to ribozymes and gene therapy for HIV, many difficulties in the delivery of siRNA in vivo can be envisioned. Although we cannot measure the transfection efficiency of siRNA in primary CD4+ T cells, we believe it is quite high, given that we can inhibit HIV infection and replication. Studies are ongoing to measure the efficiency of the generation of active RISC in primary cells after siRNA transfection. The in vivo delivery of siRNA complexed to lipofectin presents an additional challenge. Studies using a transcription reaction with CTP and UTP replaced by 2′-F-dCTP and 2′-F-dUTP for generation of siRNA, previously demonstrated to result in RNA resistant to RNase A, demonstrated that siRNA could be delivered to cells without lipofectin complexing and in the presence of serum. Thus, in addition to demonstrating that siRNA can inhibit viral infection in mammalian cells, we also show that primary CD4+ T cells can be efficiently targeted and that functional siRNA can be delivered in the absence of complexing with a carrier, such as cationic lipids, and in the presence of serum. These observations, in addition to demonstrating inhibition of HIV replication in primary CD4+ T cells, begin to address the multiple complications likely to be encountered in the use of siRNA in animal models. We thank Dr. Stuart Isaacs for critical review of the manuscript. The following reagents were obtained through the AIDS Research and Reference Reagent Program, Division of AIDS, National Institute of Allergy and Infectious Diseases, National Institutes of Health: U87-CD4+-CCR5+ and U87-CD4+-CXCR4+ from Drs. HongKui Deng and Dan Littman, and IL-2 from Hoffmann-LaRoche (Nutley, NJ). ↵1 This work was supported in part by a grant from the Pediatric AIDS Foundation, 27-PG-51257. ↵3 Abbreviations used in this paper: RNAi, RNA interference; CTP, cytidine 5′-triphosphate; iu, infectious unit; LTR, long terminal repeat; PTGS, posttranscriptional gene silencing; RISC, RNA-induced silencing complex; siRNA, small interfering RNA.